Starbursts are sites of large-scale, extremely high-rate star formation. These systems experience star formation at a rate that can only be maintained in equilibrium if the duration of the star formation activity (perhaps 10 million years) is short compared to the life of the galaxy. Though our understanding of their causes, properties, and evolution is not complete, a large fraction of high-luminosity starbursts are thought to be triggered by interactions between galaxies. It is also believed that the bars within barred spirals may be the cause of some starbursts. Effects such as these cause interstellar gas to be compressed and heated, and converted rapidly into stars. Often this occurs within the galaxy nucleus itself. How do starburst galaxies appear in X-rays? IMAGE:- X-ray emission from the famous starburst galaxy NGC253. Low temperature X-ray emission is shown in red and high temperature X-ray emission is shown by the contours. Most striking are the huge plumes extending above and below the galaxy spiral disc (shown schematically by the ellipse - i.e. we are seeing the galaxy almost edge-on). This galactic wind is due to supernova explosions within the starburst nucleus. 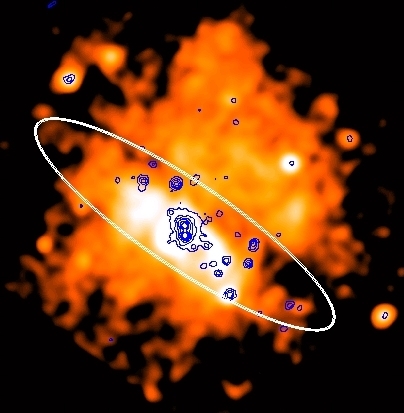 Also very visible in contours are many point sources, the brightest of which are seen at the starburst nucleus. Starbursts tend to have very enhanced X-ray emission compared to more normal galaxies, and their X-ray emission usually originates from spatially extended regions, the largest of which is often at the galaxy nucleus. As these massive stars in the starburst nucleus go supernova, the combined mass of hot supernova gas can blow out of the plane of the galaxy in huge plumes, and can be visible in X-rays extending for perhaps 30,000 light years. Hydrodynamical computer models have been performed to try and mimic these features. IMAGE:- A numerical simulation of a starburst-driven wind. The picture shows the gas density (a logarithmic plot, red represents high density, blue represents low density). Energy and mass deposited into the interstellar medium of the galaxy by the starburst region (in the bottom centre of the image) heats the gas up to millions of degrees, where it emits X-rays. The hot gas expands and eventually breaks out of the disk of the galaxy, escaping into the halo of the galaxy at approximately 1000 km per second.